Pre-registration is coming up soon, but we STILL need more games! On Friday, May 25th, Pre-registration will go live! But we’re making one last push to get more games! We want to make sure everyone gets to play as many games as they want in as many slots as they can!! Boardgames, card games, role-playing games, mini games, we will take them all! AND, we’re even opening up the games list to everyone now, so that you can see what’s already being run, and where you can try to get some more games in. 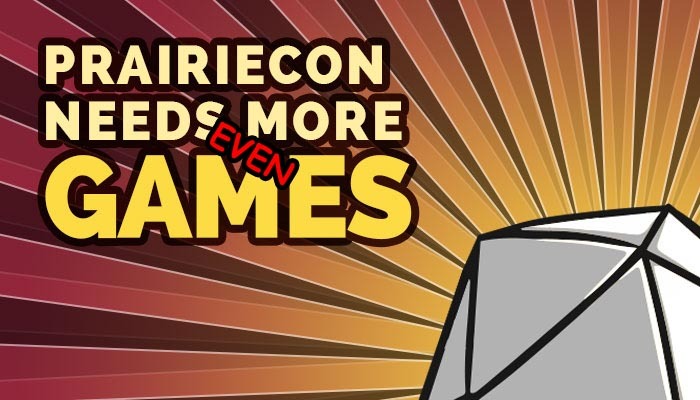 You may be saying to yourself, “But PrairieCon, that’s already an awful lot of games.” YES, it is a lot of games, but it’s not the gigantic list that we normally offer, which is why we’re asking you again to look over your games library, take a look at our current games list, and then contact games@prairiecon.com and let us know what you’d like to run! Attached are the .pdfs with the information you will need. Email us at games@prairiecon.com with your games submissions and any questions you may have. PrairieCon will be at Assiniboine Community College this year, on June 15-17, 2016. Like last year, we have 17 slots running throughout the weekend with a duration of 2 hours each. In this way, we offer many shorter game slots with the option of double or longer slot opportunities for longer games.